The Deck- our versatile floating stage available on the Yarra River and Maribyrnong River is ideal for musicians, caterers, entertainers and masters of ceremonies. It boasts a working space of 8m x 2.5m so there’s ample room for a band, musician or entertainer to set up. Use it as a dais, podium or rostrum. Perfect for speakers, announcers and event coordinators. Set up a lectern, microphone, independent power supply or DJ console. The floating deck has been used in product launches, presentations and as a floating billboard advertisement, with a 3D message instead of a bland two-dimensional presentation. 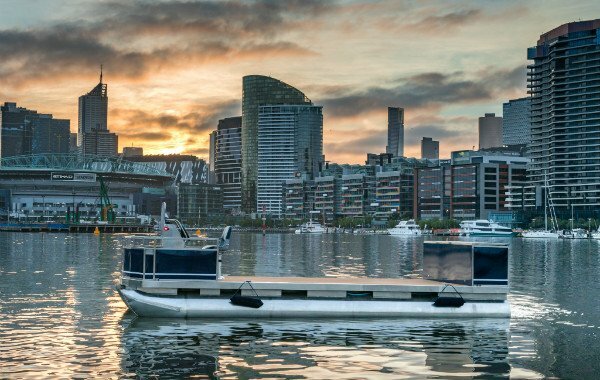 Place your product or business front and center and float your message as a mobile banner, down the waterways of Melbourne. The Deck supports a payload of 2000kg. This floating dais will accommodate a 16 piece band, or single entertainer- to add uniqueness to your party or corporate event. There’s enough capacity and space- to support a portable power bank too. The floating platform characteristics of The Deck have been a hit with film makers, movie producers and creatives. If you’re doing photography or video- and you want a mobile platform from which to shoot, and set up booms, gimbals or sliders- for filming spectacular footage, this mobile floating work platform for hire can give you an operational- and creative- edge as a film maker or photographer, especially if you are photographing models, actors or performers who are onboard one of our boats. Fancy an escape to your own little private island without leaving Melbourne? We’ve got the best way of achieving this, within the CBD itself. The Deck- as floating podium- can be set up for a very private dinner for one couple or a small group. It can be anchored in the most picturesque spots along Melbourne’s rivers- so you can design a date complete with catering, drinks or proposal. The floating platform can be utilised by wedding parties for ceremonies- with guests onshore or on an independent vessel. The versatility and almost limitless placement options mean that the rostrum can serve as a mini jetty for boarding our boats in shallow water by the river’s edge. 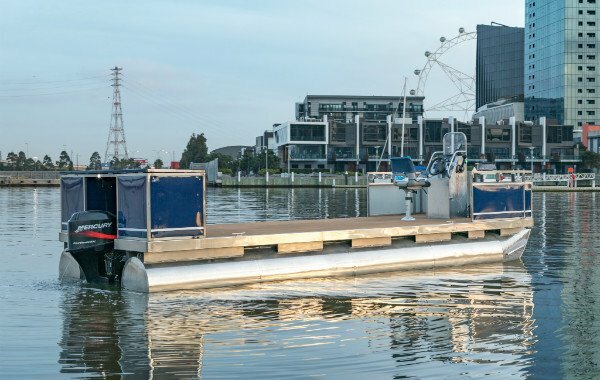 The Deck provides extended reach from the shore to a vessel, which means you have a greater selection of boarding locations along the Yarra River or Maribyrnong River.